In May we reported that a large and possibly substantial mall could be built up the street from the Toronto Eaton Centre. We've got an update - a prominent building on the same block has been purchased as part of a land assembly. The Yonge Street Mission, located at 381 Yonge Street, has been sold to a private equity real estate company. The sale's closing date will be some time in September 2016, allowing the Mission to move and reorganise its operations. The Yonge Street building is adjacent to other buildings already owned by investors Kingsett Capital and the Canada Pension Board. In April of 2013, Kingsett Capital and the Canada Pension Board purchased several adjacent properties from Primaris Real Estate Investment Trust. Sources tell us that there could be a proposal for a substantial shopping mall on the site, possibly connected to Ryerson University and also possibly including a large anchor retailer. We're not sure what exactly is proposed for the site, though the Ryerson University Master Plan might give some clues. The rendering at the top of this article shows a proposed commercial podium topped by a taller tower. The immediate area has seen extensive development including an expanding Ryerson University, Canada's tallest residential building (Aura at College Park) as well as the newly-branded Eaton Chelsea Hotel (formerly known as the Delta Chelsea Hotel). The area is enjoying a growth in popularity as well as a substantial increase in its residential population as Toronto continues its condo boom. We'll continue to keep you updated on this topic, as it could lead to a substantial retail development that could house a Downtown Toronto Target, Walmart, or even La Maison Simons. Link to our previous article breaking news on the potential Yonge Street shopping centre. "Canada Pension Board", "Kingsett Capital", "Primaris", "Ryerson University", "Toronto Eaton Centre", "Toronto"
LOFT opened its first Canadian store at Toronto's Yorkdale Shopping Centre in November 2012. LOFT will be announcing more Canadian locations in the coming months. LOFT is considered to be a more 'relaxed' and 'younger' version of sister label Ann Taylor. Ann Taylor is a moderately upscale womenswear retailer. The United States has over 500 LOFT stores. "Ann Taylor", "Hamilton", "LOFT", "Lime Ridge Mall", "Markville Shopping Centre", "Mississauga", "Square One Shopping Centre", "Toronto Eaton Centre", "Toronto"
A large retail complex could be built just north of the Toronto Eaton Centre. We received word from a source saying that we should be paying attention to the east side of Yonge Street between Gerrard and Gould Streets. For some time, Primaris REIT had been quietly purchasing properties on the Yonge Street block, adjacent to Ryerson University. Ryerson owns the southern portion of the site which was formerly home to Sam The Record Man. Based on the above, Primaris appeared to be considering redeveloping the block and notes that it is open to further land assembly (acquiring adjacent properties for amalgamation). On April 4, 2013, Kingsett Capital and the Canada Pension Board purchased Primaris' Yonge Street properties. We are awaiting to hear back from Kingsett as to their intentions for the block. Ryerson University has also noted that it could consider redevelopment of its portion of the block, along with lands immediately north. This has been set out in the Ryerson University Master Plan. It should also be noted, however, that the Ryerson Student Centre is currently under construction on the Ryerson-owned site. We're not sure if there is a possibility that it could become integrated into a joint retail project. All of the above is currently speculation and we have little further information at this time. If such a project did go ahead, it could provide retail space for multiple retailers plus one or more large retailers seeking Downtown Toronto space including Nordstrom, La Maison Simons and Target. A source tells us, however, that they expect Target could secure space in the neighbouring Atrium On Bay building which is also undergoing redevelopment. Ryerson University has previously entered into joint ventures with retail developers, including the Ted Rogers School of Management building adjacent to the Toronto Eaton Centre. We extend thanks to Gil Meslin, urban planner at DIALOG for directing us to the Ryerson University master plan and related information and to his coworker, David Fitzpatrick, for directing us to the Primaris information. David has an excellent urban planning blog called Reurbanist and we follow his twitter daily. "Atrium on Bay", "Primaris", "Ryerson University", "Toronto Eaton Centre", "Toronto"
Browns Shoes will open a 5000 square foot store at Toronto's Eaton Centre. This will replace its current smallish 2500 square foot store. Browns will replace Sephora cosmetics, which will move to a larger space on the same floor. Browns' store will be on Level 3 of the Eaton Centre (as is their current store), often considered the 'most prestigious' floor in the mall. This may not arguable by true but Level 3 is the brightest level since it receives sunlight from the skylights above. Browns stores are from Montreal and have stores across Canada. Their stores vary in size, reaching as large as 8000 square feet. Browns once had concessions at Holt Renfrew and Hudson's Bay stores in Canada, as well as at Joseph's of Chicago (a Chicago-based shoe retailer that went bankrupt). These concessions have since closed, leaving free-standing locations. Browns is one of our favourite shoe stores, especially when they have a sale. We admit we have a shoe problem... we don't have enough room for all of our shoes. Many readers can probably relate. We make regular trips to Browns and its 'younger' store, B2. Both carry private-label and designer shoes with some of the best brands available in Canada. Browns is in expansion mode and will be opening more Canadian locations. Watch our website/Facebook/Twitter, as we'll update you when we find more openings/expansions. "Browns Shoes", "Sephora", "Toronto Eaton Centre"
Nordstrom, Simons,Target or Walmart in New Downtown Toronto Mall? We have received word that Oxford Properties' proposed new Downtown Toronto shopping centre is already being eyed by retailers such as Nordstrom, La Maison Simons, Target and Walmart. A new 1million square foot shopping centre is being proposed by Oxford (along with convention/office/residential/hotel space and possibly a casino) which may rival The Toronto Eaton Centre for patrons and possibly exceed its size. The mall would be located on a mult-use, 11 acre site beside the Rogers Centre and the CN Tower. Nordstrom, Simons, Walmart and Target are actively seeking downtown Toronto space and have expressed frustations at lack of retail availability. The Toronto Eaton Centre is space-limited, and Sears doesn't seem willing to give-in to Cadillac Fairview's offer to buy-out its lease for a new flagship Nordstrom store (or for Simons, also eying a chunk of Sears' space). We reported earlier that Nordstrom is seeking 225-270,000 square feet, while Simons wants 100,000+ square feet in Downtown Toronto. 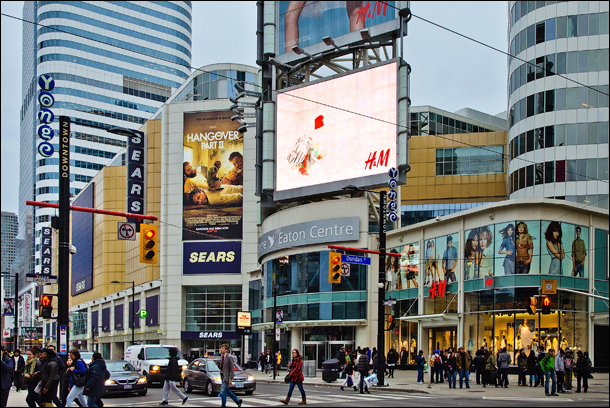 The Toronto Eaton Centre's non-anchor square footage is 582,000 square feet (Sears, Canadian Tire and Best Buy add another 1.035million square feet). The proposed Oxford Place would be around 1 million square feet, making it possibly 'grander' than Toronto's Eaton Centre's non-anchor retail portion. More importantly Oxford Place could become home to substantial anchor-tenants, ranging from lower-end big box retailers to large luxury retailers, depending on what the landlord deems marketable. Oxford is in the preliminary planning stages of its new project, and we've been told that it is being pressured to bring forward its planning application to Toronto City Hall 'asap' by potential tenants desperately seeking large downtown retail spaces. We will keep you updated on what might become a very exciting Canadian retail development. "Maison Simons", "Nordstrom", "Oxford Place", "Oxford Properties", "Sears", "Target", "Toronto Eaton Centre", "Toronto", "Walmart"
Nordstrom is working with Cadillac Fairview to secure a total of between six and nine Canadian locations. As we previously reported, Nordstrom will open four Canadian stores in conjunction with Cadillac Fairview in Vancouver, Calgary, Ottawa and Toronto. A second-wave of searching and negotiating for further Canadian Nordstroms is now underway. A Fairview Mall Nordstrom could coincide with a mall expansion to make it more competitive with Yorkdale Shopping Centre. 2) Toronto Eaton Centre: Sears Canada currently occupies over 800,000 sq ft of space at The Toronto Eaton Centre. Nordstrom would like somewhere between 225,000 sq ft and 270,000 sq ft of retail in this space. If the deal goes through, some Sears space may be converted to Nordstrom's Canadian headquarters, or office space may be leased in an adjacent office tower. As always, we'll keep you updated. Nordstrom is also seeking locations for its discount retail format, Nordstrom Rack. "Cadillac Fairview", "Nordstrom", "Polo Park", "Richmond Centre", "Southgate Shopping Centre", "Toronto Eaton Centre", "Toronto", "West Edmonton Mall", "Winnipeg"
Looking up Dundas St. W from Yonge Street in Toronto. We have received confirmation that Nordstrom's Canadian headquarters will be located in Toronto. Nordstrom and Cadillac Fairview are working out an office tenancy agreement in an office tower connected to the Toronto Eaton Centre. ***Update*** Feburary 1, 2013. Retail Insider cannot confirm at this time if any deals have been reached for Toronto office space for Nordstrom (we received a request for information from a reader). We initially speculated that Nordstrom's Canadian headquarters would be located above its 228,000 sq ft Vancouver, BC location. Instead, the 280,000 sq ft of office space will be leased externally. "Cadillac Fairview", "Nordstrom", "Toronto Eaton Centre", "Toronto"